Fashion was a pretty straightforward matter for me until 1980. I was still in elementary school, and up to that point my wardrobe decisions generally involved finding the matching giraffe, monkey or elephant tags on my Garanimals outfits. I was too young to take notice of the other animal that was beginning to show up on the left breast of some of the older kids’ shirts, an alligator, or to pay attention to a new book that had just come out that year, The Official Preppy Handbook, a compact little handbook that foreshadowed the clean-cut conservatism of the decade that was to follow. As preppy culture trickled its way down to the fourth grade, Izod shirts by Lacoste soon replaced Mag Scrambler bicycles as that next thing that we all simply had to have. But, unfortunately, these fancy little shirts with the alligators stitched into them weren’t something we all could afford. As a nine-year-old I’d relegated much more mental energy to Boba Fett than to issues of class, but I began to notice that the kids in school who came from the wealthiest families were all wearing the coveted alligator shirts. The rest of us got stuck with the humiliating knock-offs. There was the fox Izod knock-off, which was sold at JCPenney. And then there was the dragon Izod knock-off, which was even worse. It was sold at Sears-a company where only the cheapest and/or poorest families shopped for anything other than refrigerators. My father was an employee at Sears, so naturally I got stuck with the dragon. After much teasing, I finally convinced my parents to buy a generic shirt that didn’t have a tag on it at all. Luckily, my older brother had somehow managed to stain his authentic Izod (he worked at Kentucky Fried Chicken and had bought one with his savings) and, having access to a spare alligator, I asked my mother to sew it onto the breast of my unadorned generic shirt. Of course, I didn’t fool anyone. My mom’s stitching was overly bulky and she somehow managed to make the alligator’s tail appear painfully dislocated. Plus, the shirt itself was clearly a fake-it was way too thin and made of some synthetic poly-fiber that was likely outlawed circa 1985 for causing melanoma in laboratory monkeys. I was busted about five minutes after exiting the bus, when a preppy bully with a popped collar grabbed me to inspect the tag sewn into the neck of my knock-off. I was exposed. Despite my early run-ins with bullying preps, I recall The Official Preppy Handbook with fondness. When my sister was given a copy as a gift, I remember devouring it, knowing through the wisdom of my high-school-aged siblings that it was cool, even though none of us were named Muffy, belonged to a country club or would go on to get our masters from Yale. My family often joked about how preppy we were (the word to us was a synonym for high class) to reclaim a little dignity in those times when we coveted things-vacations, designer clothes, cable TV-that we knew we simply couldn’t afford. Despite its emphasis on fashion, Lisa Birnbach and company’s The Official Preppy Handbook was always something larger than a book about clothes. It was a send-up of the wealthy class, specifically Northeastern WASPs, which knowingly (and fondly) celebrated their peculiarities while simultaneously mocking them. It was smart, funny and even a bit reckless for a national bestseller. There was, for instance, a section named “Deviant Behavior: The Top 10 Drinking Schools; 20 Verbal Expressions for Vomiting.” But more interestingly it was an uncomfortable dissection of classism, pedigree and race. And as Reagan entered office, and the distribution of wealth became increasingly uneven, it became, well, important; an edgy satire of the times. I’m certainly not alone in saying it influenced me. It was a book that I channeled with nostalgia two decades later when I was writing a handbook of my own, The Hipster Handbook. Given a publishing industry so desperate that it’s trolling Tumblr sites in search of bestsellers about ferrets wearing berets, it’s no surprise that a sequel to The Official Preppy Handbook is here. 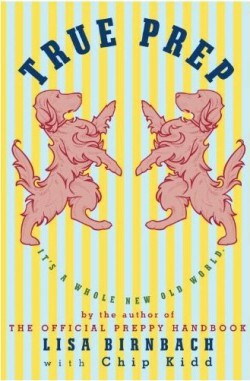 With the tagline, “Wake up Muffy, We’re Back,” Lisa Birnbach returns as the arbitrator of all things preppy in her new book True Prep: It’s a Whole New Old World. This time she’s paired up with influential graphic designer Chip Kidd to create a much more expansive, 250-page homage. It pains me to says this, given my admiration for the original, but we need a sequel to The Official Preppy Handbook about as much as we need a sequel to Real Men Don’t Eat Quiche. It’s hard to criticize the design or the thoroughness of True Prep. But the whole misguided project, published during the harshest economic times since the thirties, leaves a foul taste in the mouth of anyone who the recalls the first incarnation with fondness. When the first Preppy Handbook was released, we’d just struggled our way through two energy crises and were headed towards recession. It was the era of trickle-down economics and “Dynasty,” when people where much less cynical about the wealthy. An era when we’d yet to experience “too-big-to-fail” and the AIG bailouts. The Preppy Handbook introduced regular folk to Prepdom: a privileged, madras-filled world occupied by golden retrievers and children who called their mothers “mummy.” Of course, people always enjoy mocking the rich, but in the 80s people also wanted to emulate what they perceived to be their genteel ways. Needless to say, we live in profoundly different times. There’s certainly no denying that the preppy aesthetic has made a comeback. Ushered in by cultural forces like “Gossip Girl” and the popularity of Ivy League rockers Vampire Weekend, argyle, rugby shirts, and loafers by G.H. Bass & Co. are now as ubiquitous as they were in their 80s heyday. Not surprisingly, True Prep devotes plenty of ink to fashion (preps now love polar fleece), but like the original Preppy Handbook, the book is much more about class than it is about style. True Prep comes across as callous and out-of-touch with the times. Take the chapter on rich people behaving badly. After listing a number of wealthy individuals who have found themselves on the wrong side of the law (none of whom are John Thain, Ken Lay or Bernie Madoff-she opts instead for Winona Ryder, former Sotheby’s CEO Dede Brooks and, uh, Don Draper), Birnbach’s tone-deafness is on full display. Offering some advice for the nouveau riche, she writes “[b]uying your way onto boards is done,” as long as you don’t flaunt. In moments such as these, readers of True Prep will find themselves longing for more biting satire, such as Chris Lehmann’s Rich People Things, a funny yet scathing indictment of the excesses of the wealthy. By comparison, True Prep’s vapid celebration of pedigree makes Stuff White People Like feel like a profoundly inflammatory call-to-arms against the aristocracy. Clearly, I’m not the only one who noticed how out-of-step this book is for the era: its initial first-print run was honed down from 150,000 copies to a much more modest 60,000. In other moments True Prep becomes overly earnest and preachy. Perhaps it’s the passage of the years, but Birnbach spends an inordinate amount of time apologizing for the preps of yore. She writes, for instance, that preps “wholeheartedly condemn the use of drugs” and backpedals on the politically incorrect topic of birthright (a touchy subject in Preppy Handbook 1.0) by devoting a section to the societal importance of adoption. In a clumsy attempt to make the book more sensitive about race, she provides the recipe for a drink called The Mixed Marriage and informs us that preps are supposed to use the terms “chef” and “driver” instead of “cook” and “chauffeur,” respectively, when talking about the help. Um, okay. If you only have a housekeeper, allow her to “make a treat from her native land, whether it be a kind of wonton, or a kind of lentil thing, or maybe even a fish stew,” she suggests. Meanwhile, Birnbach attempts to desegregate preppy culture by enlisting Obama as a member. If, in 1980, you had whispered to a few friends that within the next few decades, America would elect a thin, black, preppy basketball-playing lawyer to be President, they would have laughed at you and exhaled in your face, inside the restaurant or club where you were sitting. Her intentions are good, but I’m sorry, anyone who has seen the video of Obama tossing out the first pitch at the All Stars game wearing his self-proclaimed “frumpy” dad jeans knows that he is anything but preppy. At its most uncomfortable, there’s an interview with David Coolidge, the Muslim Chaplain of Brown University (Birnbach’s alma mater). Suggesting that today’s Prepdom is of the big tent variety (Birnbach is brunette and Jewish) she explains that Coolidge, a white, “well-spoken,” Islamic convert from Chicago, is proof that “anyone can assimilate into our world.” Again her intentions are good, but I found myself longing for a list that detailed twenty new synonyms for vomiting. Of course, True Prep is being marketed as a satire, so anyone seeking profound social commentary on racial inequality and classism is probably asking for too much. (Although the first one pulled it off.) True Prep is largely devoid of humor other than its campy references to 80s nostalgia. As the subtitle “It’s a Whole New Old World” indicates, one of True Prep’s major themes is that preps, a smugly discreet and old fashioned tribe, are destined to feel out-of-step in this very public age of cell phone chatter, Facebook and JWoww. It’s a clever insight into the reactionary nature of “old money,” who were always the subject of Birnbach’s satire in the first place. But ironically, the book’s smugly discreet tone is precisely what is most exasperating about True Prep. Let’s face it, most Americans are too busy trying to make ends meet to discuss with “loving irreverence” those dandily-dressed hedge-funders. And should the topic be broached, the last thing they’re looking for is a little old fashioned discretion. I’ll of course continue appreciating the first Preppy Handbook. But comparing this injudicious sequel to its 80s original is like comparing that shirt I once wore with the alligator sewn into its breast with a true izod Lacoste. It doesn’t stack up.